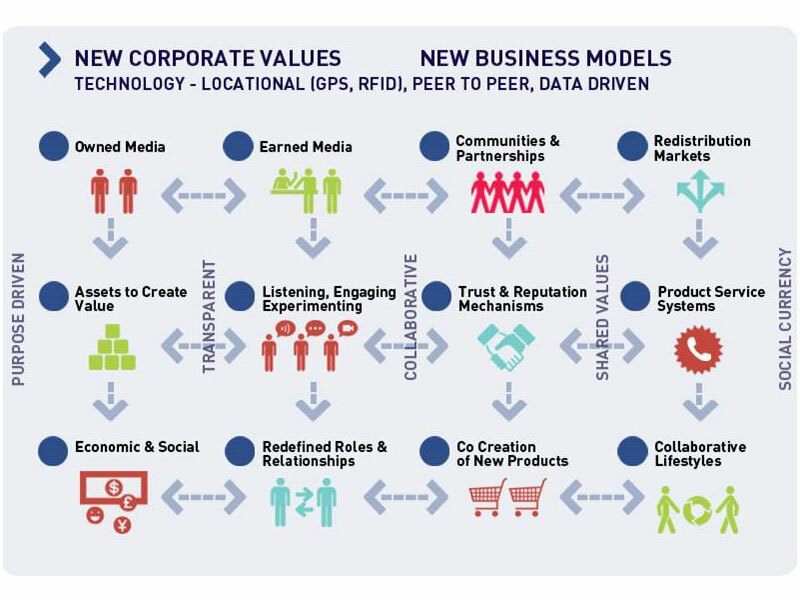 New information technologies and enterprise innovation have stimulated the growth of new business ideas and models, collectively known as the ‘new sharing economy’. The new sharing economy has changed the way we do our daily work. In the new sharing economy buyers and sellers of various services connected through a service provider who usually operates an app or website – such as Facebook, Apple, and Twitter (which open their ecosystems to outside software and app developers). A report commissioned by the European Parliament defines the new sharing economy as “the use of digital platforms or portals to reduce the scale for viable hiring transactions or viable participation in consumer hiring markets […] and thereby reduce the extent to which resources (assets) are under-utilised”. Venture capitalists adore this business platform model, because it lets companies scale up with limited funds. Well-known examples of business platforms in the new sharing economy include Airbnb (which lets people rent out unused rooms, apartments, or homes), Blablacar and Uber (on-demand car service). Airbnb began somewhere in 2008 and now, millions of hosts and holidaymakers/tourists choose to create a free Airbnb connections through information technologies and choose to book their exceptional accommodation anywhere in the world. Now an average of 425,000 people use Airbnb in every night worldwide, and the company is valued at $13 billion, almost half the value of 96-year-old Hilton Worldwide, which owns actual real estate according to CMA- Australia (2016). BlaBlaCar began in 2006 and it is now the world's biggest long-distance ridesharing community and it links drivers and passengers who are ready to travel together between cities and share the cost of the journey. Now, it has more than 25 million members across 22 countries. The other most popular business platform is Uber taxi service. This service is very successful and popular in car sharing (taxi) service. It is popular in the USA, Europe and in Australia. Despite some regulatory and legal disputes, Uber expects to scale its business model in India, China, and the rest of Southeast Asia. CMA –Australia indicates that Uber is valued at $41.2 billion, making it one of the 150 biggest companies in the world–larger than Qantas, FedEx or Viacom. According to Times Magazine (January, 29, 2015), Uber operates in 68 countries and 371 cities worldwide. The value proposition of these business platforms is the reduction in transaction costs included in selling, renting, lending, labour trade, and provision of services for buyers and sellers, in a way that enables exchanges which were previously not feasible. This in turn leads to a real economic gain because the resources (assets) involved in these transactions can be used more intensively. The trend in transaction cost reductions is likely to move economies away from ownership and towards subscription and rental models which allow on-demand use of goods and services such as transport and lodging. In the emerging new sharing economy, the change in cost structures, ownerships and legal contracts between the traditional and sharing economy organisations is substantial. Many studies indicate strategic and business contractual issues between buyers and sellers are changing, particularly in new service development contexts, and management accountants must be mindful of this transformation to be proactive. Greater competition and increased outside attention to cost minimization strategies, all make an efficient and effective cost accounting system more important than ever. This means the right product cost determination is essential to reach an appropriate and challenging pricing strategy. Understandably, the legislative battles will increase, and management accountants need to keep an eye on the fast changing new market environment. How will on-demand approach to cars, accommodation etc., change the way we think about owning things? How might on-demand ridesharing affect the way we perceive mobility? What will peer-to-peer services mean for how we move local goods and services? Could errand and skill marketplaces help define the future of labour and overheads? The real power of the sharing economy is that it can serve as a zoom lens, offering a transformative perspective on the social, economic and environmental value that can be created from any of a number of resources in ways and on a scale that did not happen before. In that transformation lie threats -- and great opportunities for management accountants. I believe the experiential learning is very important and a major characteristic to perform exceptionally in the new sharing economy.